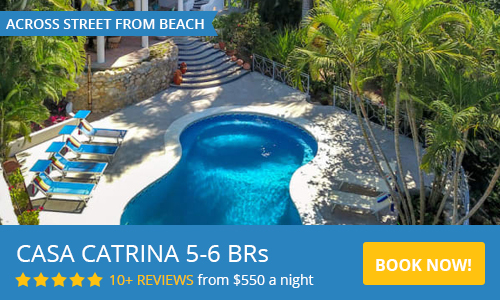 Sayulita’s location on the Central Pacific coast of Mexico, hemmed in by jungle covered mountains, gives it a sub-tropical climate with only two seasons, dry, fairly warm winters (November to May) and hot, semi-humid wet summers (June to October). The Sayulita region averages 345 days of sunshine and 60 inches of rain a year. Winter temperatures in Sayulita average 27C (80F) with sunny, dry days and cool evenings for perfect sleeping temperatures. If you are used to a warm climate, you may need a light sweater or long sleeves at night, in January and February, but most people from colder climates find the temperatures at night quite nice. Tropical thunder and lightning storms are normal, however, hurricanes are extremely rare on this stretch of coast. Summer temperatures in Sayulita include high humidity and rainstorms generally in the late afternoon/evening, which cools the air down for the night. August and September are the wettest months in Sayulita. Summertime humidity can make it seem hotter than it is, but if you find a shady spot or a place with an ocean breeze, it is still comfortable. The thunderstorms provide brilliant lightning shows out over the ocean at night. The summer weather in Sayulita makes for a lush, green jungle, and vibrant flowers and trees around town.